Latte is a kind of coffee made with espresso and hot milk. Coffee and milk have been part of European cuisine since the 17th century. Caffè latte, Milchkaffee, café au lait and café con leche are domestic terms of traditional ways of drinking coffee, usually as part of breakfast in the home. Public cafés in Europe and the US it seems have no mention of the terms until the 20th century, although Kapuziner is mentioned in Austrian coffee houses in Vienna and Trieste in the 2nd half of 1700s as "coffee with cream, spices and sugar" (being the origin of the Italian cappuccino). According to the Oxford English Dictionary, the term caffè latte was first used in English in 1867 by William Dean Howells in his essay "Italian Journeys". Kenneth David maintains that "...breakfast drinks of this kind have existed in Europe for generations, but the (commercial) caffè version of this drink is an American invention". The French term café au lait was used in cafés in several countries in western continental Europe from 1900 onwards, while the French themselves started using the term café crème for coffee with milk or cream. The Austrian-Hungarian empire (Central Europe) had its own terminology for the coffees being served in coffee houses, while in German homes it was still called Milchkaffee. The Italians used the term caffè latte domestically, but it is not known from cafés like Florian in Venice or any other coffee houses or places where coffee was served publicly. Even when the Italian espresso bar culture bloomed in the years after WW2 both in Italy, and in cities like Vienna and London, espresso and cappuccino are the terms, latte is missing on coffee menus. In Italian latte (pronounced [ˈlatte]) means "milk"—so ordering a "latte" in Italy will get the customer a glass of milk. In Spanish the phrase café con leche (coffee with milk) is used; by default this will be in a small cup. In English-speaking countries latte is shorthand for caffelatte or caffellatte (from caffè e latte, "coffee and milk"), which is similar to the French café au lait, the Spanish café con leche, the Catalan cafè amb llet or the Portuguese galão. The Caffe Mediterraneum in Berkeley, California claims Lino Meiorin, one of its early owners, "invented" and "made the latte a standard drink" in the 1950s.The latte was popularized in Seattle, Washington in the early 1980s and spread more widely in the early 1990s. In northern Europe and Scandinavia, a similar "trend" started in the early 1980s as café au lait became popular again, prepared with espresso and steamed milk. Caffè latte started replacing this term around 1996–97, but both names exist side by side, more often more similar than different in preparation. Outside Italy, a caffè latte is typically prepared in a 240 mL (8 US fl oz) glass or cup with one standard shot of espresso (either single, 30 mL or 1 US fl oz, or double, 60 mL or 2 US fl oz) and filled with steamed milk, with a layer of foamed milk approximately 12 mm (1⁄2 in) thick on the top. In the US, a latte is often heavily sweetened, with 3% or even more sugar. The drink is related to a cappuccino, the difference being that a cappuccino consists of espresso and steamed milk with a 20 millimetres (0.79 in) thick layer of milk foam. A variant found in Australia and New Zealand similar to the latte is the flat white, which is served in a smaller ceramic cup with the micro-foamed milk. In the United States this beverage is sometimes referred to as a wet cappuccino. In the United States, an iced latte is usually espresso and chilled milk poured over ice. Unlike a hot latte, it does not usually contain steamed milk or foam. Iced lattes almost always have sugar or flavoring syrups added, and are sometimes served blended with the ice. The espresso can be pre-chilled (sometimes as a mixture of espresso and milk) or frozen in advance to avoid warming up the drink. A glass of latte macchiato. The latte macchiato is milk steamed to microfoam, served in a glass with a half shot of espresso poured gently through the foamy top layer, creating a layered drink with a "macchia"—a spot—of espresso on the top. As with a caffè macchiato, which is espresso with a spot of milk atop, indicating there's a hint of milk underneath the espresso foam, a latte macchiato is the opposite, to indicate there is espresso in the milk. The use of the term 'macchiato' has been widened to include a huge array of beverages and ice creams. In some countries (like Germany), latte macchiato is the preferred term. The word "macchiato" itself is Italian for "stained" which refers to creating a coffee or milk "stain" in the drink. Although the term macchiato has been used to describe various types of espresso drinks, a caffè macchiato is 3/4 espresso and 1/4 steamed milk. A caffè macchiato is about 2–3 imp fl oz; 2–3 US fl oz (60–90 mL) and is usually served in a demi tasse. Although a traditional macchiato is small, there are still ways to pour art into the crema of drink. The only difference between pouring latte art and macchiato art is that for a macchiato, the milk has to be poured faster and through a much smaller stream. A cup of Latte made with Matcha, Called Green Tea Latte. Popular variation of Latte found in Asian Countries. In some establishments, lattes are served in a glass on a saucer with a napkin to hold the (sometimes hot) glass. A latte is sometimes served in a bowl; in Europe, particularly Scandinavia, this is referred to as a café au lait. 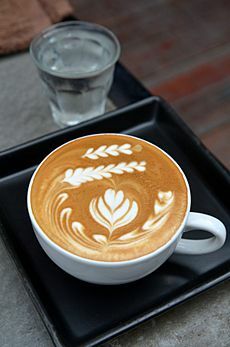 Increasingly common in the United States and Europe, latte art has led to the stylization of coffee making, and the creation of which is now a popular art form. Created by pouring steaming, and mostly frothed, milk into the coffee, that liquid is introduced into the beverage in such a way that patterns are distinguishable on the top of coffee. Popular patterns can include hearts, flowers, trees and other forms of simplistic representations of images and objects. Iced latte is often served unstirred so that coffee appears to "float" on top of white milk in a glass cup. A variation of the iced latte, known as the "bootleg latte", "ghetto latte", or "poor man's latte", is an iced espresso ordered in a larger than normal cup filled up with free milk from the condiment station. The drink has spawned debate at coffee shops where an iced espresso is considerably cheaper than an iced latte. Latte enthusiasts have also taken a liking to the water latte. Frothed with water instead of milk, this specialty drink has become accredited for it's crisp clean taste, and is also dairy-free. In Asia and North America, lattes have been combined with Asian teas. Coffee and tea shops now offer hot or iced latte versions of chai, matcha, and Royal milk tea. Other flavorings can be added to the latte to suit the taste of the drinker. Vanilla, chocolate, and caramel are all popular variants. In South Africa a red latte is made with rooibos tea. Soy milk latte with latte art. 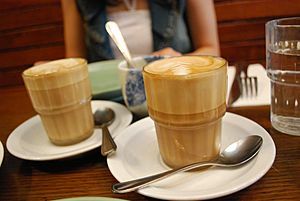 An alternative version of latte can be prepared with soy milk or oat milk, as both have the ability to foam in the same way as cow milk, with soy milk versions being more prevalent. Such alternatives are popular among people with lactose intolerance and vegans. Latte Facts for Kids. Kiddle Encyclopedia.